It's our sad task to report that Promixis is closing it's doors to direct to consumer business. We will no longer sell Girder nor the PIR-1/PIR-4 products via our online store. If you have an ongoing need for our solutions please contact sales@promixis.com to discuss how we can best serve your needs going forward. Promixis offers computer based home automation automation software. With our automation software solutions, you will be able to interact with many devices and applications used in home automation, security, and home theater. Promixis home and commercial automation software Girder is perfect for the beginner in home automation, up to the most advanced applications in industrial and commercial automation. With a wide variety of uses, Promixis Girder has the ability to interact with devices and other software to provide the most control over your computer, house, lights, security system, home theater, and more. Add a PIR-1, PIR-4 or a PIO-1 to the mix and now you can easily control almost any IR hardware in your house. Some examples of applications for Promixis software. Non-Profit. Need automation in your church? Health Care Automation providing independence to people with physical disabilities. Infra-red remote control over almost any consumer electronic (TV,DVD, Bluray etc) with advanced protocol analytics. Why Promixis software and hardware? Girder, the automation solution from Promixis has an open architecture which allows you to fully control exactly what the automation system should do. Often packages are limited in what they can do and will charge for every extra feature. Not with Girder. Girder you buy once and all features are activated. No nickle and diming, no in-app purchases. Girder has many plugins for many different pieces of hardware. This allows you to combine products from very different manufacturers into one coherent automation system. 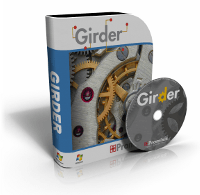 Girder has been automating everything from homes, computers, churches, offices, DoD to TV studios since 1998. Chances are we've seen your scenario before and can help getting you going. Girder supports a multitude of Operating Systems including Windows (XP+), Linux (Debian), Android (for the front-end), iOS (for the front-end) and the Raspberry Pi. Is your choice not listed? Contact us and see if we can provide a build for your system. With Girder you're not going to get stuck with an outdated piece of equipment. Promixis does not track and monitor your automation on-goings. We believe in privacy and we are not gathering statistics on how much you turn on and off your lights and at what time. Nor do we keep track of when you are home or not. And since we don't have these statistics we do not sell them to the highest bidder. Need help determining if Promixis software is right for your solution? Our knowledgeable staff is available on our forums or by phone, providing support and advice for Promixis software and customers. For anything ranging from general support to advanced Lua scripting, our skilled staff can help answer your question. If you have special requirements but do not have the time or capacity to design them, Promixis offers consulting services for all of our products. Give us a call and find out about our consulting services, and how they can help save you time and money in designing automation solutions.